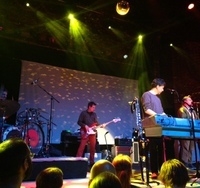 They Might Be Giants performed at the Ogden Theater on June 7th, showcasing their new album release, Nanobots, while interspersing some of their more popular hits from the 90’s. The group is best known for an unconventional and experimental style of alternative music. To say they are ‘quirky’ might be a bit of an understatement. This is definitely a band to see live, because though they may be a bit pitchy at times, they are lively and comedic, and make you forget that they don’t have the greatest of vocals. However, the musicianship is definitely noteworthy, and it’s always impressive to see band members switching around the instruments and getting the chance to showcase talents in other areas. Their new album “Nanobots”, which released in late March, is a bit different from previous albums, and while it may take some time for avid fans to get used to, it is definitely worth the listen.